Braid, Monofilament, Fluorocarbon fishing line. What’s the difference. There are a few different fishing lines that can be used for different occasions. I think a lot of this is personal preference to the fishermen using the line. There are some facts and opinions from me that might help you choose the right line for the right situation. Hope this helps you choose the right line to catch your dinner or your trophy fish. Monofilament fishing line – This line has been used for a long time. It is a great all around fishing line and it is fairly inexpensive compared to the other options. However it does have some draw backs. It deteriorates when it is in the sun over time and it has memory. Those annoying coils in your line, those are from the memory that the line retains being wrapped up on the spool. It absorbs water which will weaken and deteriorate the line over time. A good and bad reason to use this line is the stretch in the line. The stretch is good if your off shore fishing for big game fish and have a 200lb fish hit your line the shock is absorbed mostly through the line instead of the rod taking that hit all that at once. The extra stretch also helps the hook from being ripped from the fishes mouth when those big game fish hit that bait. The stretch could be bad if you are inshore fishing and have a lot of line out and a nice size fish hits the bait and you go to set the hook it might not set as hard or fast as a different kind of line such as braided and you could lose the fish where as if you used a different line you might have landed the same fish due to almost no stretch. But people have fished with this type of line forever so like I said at the beginning a lot of this is personal preference. Some fishermen like the “give” in the line, others don’t. Monofilament line is easily seen in the water so it could spook the fish easier than fluorocarbon but not as easy as braided line. 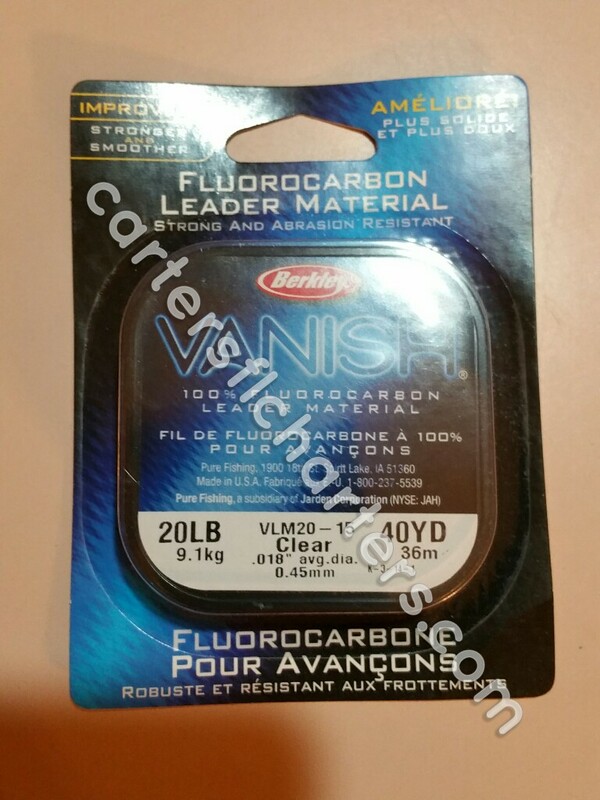 Fluorocarbon Fishing Line – I have never used the fishing line but I am avid user of the fluorocarbon leader. There is a difference and I will talk about the fluorocarbon leader later. fluorocarbon line has very little stretch to it and sun light doesn’t deteriorate it like it does to the monofilament line. It doesn’t absorb water which weakens line. It has no “reel” memory like the monofilament line so you don’t have those annoying spirals in your line. fluorocarbon line is more invisible in the water then monofilament line but it isn’t as invisible as fluorocarbon leader. Fluorocarbon Leader line – this line is only to be used as leader material. If you don’t know what leader material is, it is used at the end of the main line and connects to the hook. Usually at least 2 feet is used. This line is made to become pretty much invisible to the fish so all the fish see is the bait or artificial plastic on the hook or jig and appears like there is no fishing line attached to it so it doesn’t spook them. This leader line is extremely hard and durable. It is resistant to scraps and cuts from oysters or other debris such as rocks that the line could get caught on. It is also resistant to fish teeth when the fish swallow your bait or the dorsal fins that could cut it while fighting a fish. There are many brands of fluorocarbon leader but I prefer the Berkley Vanish Leader. I have used this for a while and it is good leader line. Braided fishing line – this type of line is a newer type of fishing line. The down side of this line is it is real prone to failure if it gets nicks in it. The good side of this line is it has no stretch to it which helps with the sensitivity of fishing. You can feel if a fish is nibbling at the end of the line ready to get hooked up and brought aboard. The bad side of no stretch is if you don’t have your drag set right (looser then normal) then you have a chance of ripping the hook out of the fishes mouth when you set the hook. This line is great from not deteriorating from the sunlight. Even if it is faded it is still strong. It is like fishing with rope so it is highly visible so fluorocarbon leader is a must if fishing with this line. This line lasts a long time so if you see the price (about $20 for 150 yards) don’t let it discourage you because it could last several years. Even if you fish all the time. I use Power Pro Braided Line with a Berkley Vanish fluorocarbon leader to fish with here in Florida in Mosquito Lagoon and it works great. I will never go back to monofilament line for inshore fishing after switching to braided line. It takes a little getting use too but it is worth it. Keep your lines tight and stay hydrated. I am currently a fireman in Central Florida on the east coast. I have a lot of time off due to my work schedule and I fish every chance I get. I own a Gheenoe boat and fish Mosquito Lagoon area. I do not have a fishing business yet but that is my goal sometime in the near future. I hope to upgrade my boat to a flats boat soon. For now I just share my knowledge of fishing and pictures of the Intra Coastal in Florida. Thanks for checking out my site. Posted on June 28, 2015, in Tools of the trade and tagged braided, fishing line, Flourocarbon, Monofilament. Bookmark the permalink. 2 Comments.